The Rimac Concept One is a full electric vehicle and supercar made by a company called Rimac Automobili from Croatia. Our local reporter Sašo Malbaša visited the factory for a tour and talked to the person behind the powerful and silent sports car, Mate Rimac – owner of Rimac Automobili. Let’s start by going back to the time Mate Rimac was graduating from high school. For his final exam he got the task to invent something unique. Other kids in the same year were »inventing« amplifiers, but Mate went a step further and made a glove that could retrofit a computer keyboard. After winning the national award on the inventor’s championship, Mate was sent to Tokyo where he won another prize. He made a side mirror which helped solving the dead angle problem. It was patented and he partially sold the rights to a company in the car industry. Four years ago, Mate started drifting, and bought a 323i E30 BMW which is known in the world of drifting as a fantastic car to learn your skills. The car had a normal engine at that point, but not for long. Mate took the car for a ride and burned the engine. So no engine, no car and no drifting. So why not make it electric? He went online, found the instructions and started ordering parts. A team of friends helped him out and they eventually put together what was his first electric car. Along the way Mate realized that the project itself wasn’t so complicated. So he started the development of his own parts and software for the car based on technology that had been implemented into the BMW. After dismantling the 323i and putting it back together at least five times, he started chasing another dream, a dream alive since his childhood. He chased his dream to become a supercar manufacturer and one of the fastest in the world. The idea was put on paper and Mate visioned his very own supercar; the concept_one. While completing and constantly improving the BMW, he gained the knowledge to start patenting the concept_one. The renamed BMW e-M3 acted as his basis to fall back on. The final package developed about 600hp on the motor and 550hp on the wheels. The car did 0-100km/h in 3.3sec producing around 900Nm of torque providing a constant push because of the electric motors. It reached a top speed of 280km/h while maintaining a range of about 180-200km. Mate was one of the very few who completed this year’s e-miglia race. Now that the BMW was done, the next step felt logical. From an idea to a sketch, from a sketch to a car. Mate got friendly with his drawing table and his laptop and started writing a patent for the car. Every single detail was documented, before he even had any investors. After sketching was finshed and the details were worked out, Mate tried to find some investors for his project. Eventually he did and started to manage a team of professionals to help him build the concept_one. The concept became reality at the 2011 IAA Motor Show. The outside lines are quite strong resembling the historical Ford GT40 sports car from the States. The rear end has a sci-fi theme, where the front resembles Ferrari-styling. The wheels on the car are custom-made specially for the electric car. They include Rimac signs in the middle and Rimac signs on the edge of the rims. The huge brake calipers and disks will cope with the immense braking power. The car has the ability to use brake energy regeneration, which is nothing more than recharging the battery while braking. The Concepe One is fitted with a camera system featuring seven onboard cameras. The car doesn’t have a back window and cameras instead of mirrors. The production model will have mirrors, because of car safety regulations. The air conditioning, the gauge and the multimedia appliances in the car are digital and specially designed by Rimac Automobili. The interior offers a combination between a soft leather and Alcantara. All the buttons on the dashboard are handmade and specially designed for the concept. The car is built in Croatia. 90 percent of the production process is done in the factory of Rimac Automobili near Zagreb. Safety? Mate is promising a lot of safety technology inside the car. Since the car has four independent motors on each wheel the car accelerates really quick and can manage its stability control a lot faster and with advanced options. The axles at the front and the back are not connected, which makes it possible to manage every single wheel at the same time. The car’s range is about 600km. 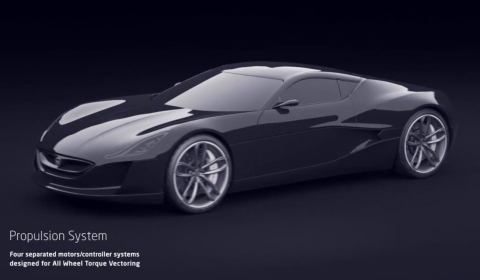 At Rimac Automobili they are developing a technology, which will improve this figure. 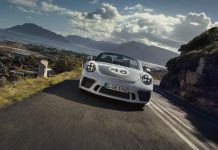 600km is a normal driving range, but in race mode the car should be capable of doing at least seven to nine laps on the Nurburgring Nordschleife. This is a total range of only 140 to 180km in race mode. The price tag of this electric supercar is an astonishing € 750,000. It will be limited to only 88 pieces, and takes about € 5 to refill.